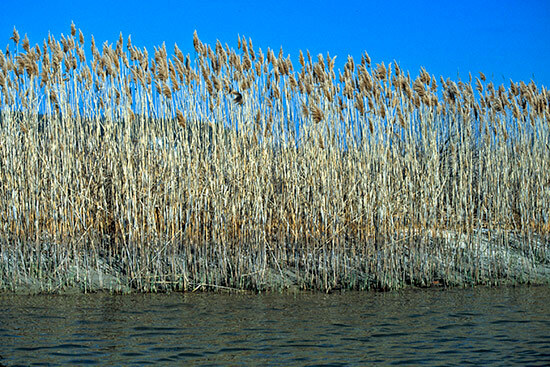 Phragmites is an invasive perennial plant with feathery plumes at the top of tall, stiff stalks. It grows in wetlands, along roadsides and along shorelines throughout the Bay watershed. While you may just be trying to take a leisurely hike through your nearest trail, or catch some fish in a local stream or river, you could be unknowingly collecting invasive species from your boots and waders as you hike and fish. Make sure to spray and wipe your boots and waders down after each time used, especially if you are traveling with them, so that you don’t accidentally invite an unwanted species to the party! Anglers are also encouraged to switch their waders from felt-soled, to rubber to avoid harboring invasives. One example of this in the Chesapeake is didymo — also known as “river snot.” Didymo is a type of algae that forms dense mats at the bottom of freshwater streams, and forms thick, heavy mats and can be tough to pull apart or remove from rocks. Firewood is often made out of dead or dying trees, which are often host to critters like the emerald ash borer — a highly damaging invasive species. Moving firewood can spread these critters from one place to another, which disperses invasive critters even more. Support your local firewood providers by buying firewood from them, and don’t move the wood once you have it. When you go to your local stream, river, or creek to fish, bait can often take the form of an invasive species in a worm or fish. If possible, seek out native bait. When finished fishing, do not dump your bait into the water. Invasive species can spread like wildfire — English ivy crawls up the sides of our buildings, covers our forests floors, and climbs up the trunks of our trees. You can do your part by volunteering at a local removal effort, or just taking the time to pluck the invasives from your own yard. Make sure to visit your local nursery and consult with them about what plants are native to your area. Think redbuds, butterfly milkweed, cone flowers, and more! Say goodbye to the bartlett pear tree, and hello to the dogwood! Your yard, and our ecosystem, will thank you. The bottom and sides of boats can carry aquatic invasive species, like different types of algae. Make sure to thoroughly wash your boat before taking it from one body of water to another, as to not spread any unwanted invasives. If you live in Maryland, visit DNR’s website to report any sightings. If you live in Virginia, you can report invasives here. West Virginia residents can report invasive species on WV DNR’s website. In Pennsylvania, you can visit the Department of Agriculture’s website for more info on how to report an invasive. DC’s Department of the Energy and the Environment website is a great resource for all district residents. For example, Pennsylvania is currently suffering from an outbreak of the spotted lanternfly, an invasive planthopper that is native to China. Being aware of this can help PA residents be prepared for what to do if they happen to see a spotted lanternfly. Native species are our best natural defense against invasive species. They require less water, save time and money, and provide vital habitat for our pollinators. Just like your boots and clothes, your pet’s paws are the perfect carrier for seeds. Make sure to check them and brush them off when traveling with your pet!